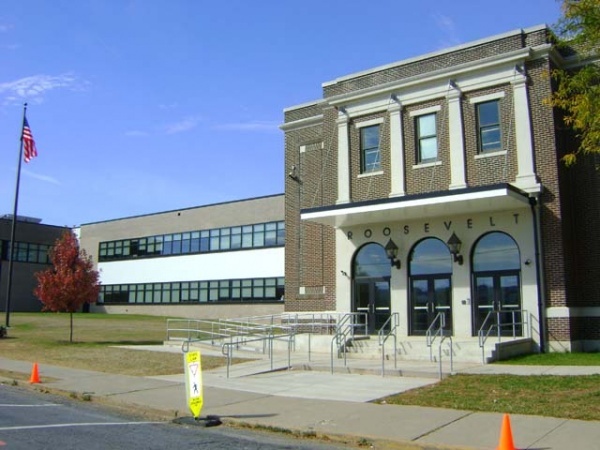 A few months ago, I attended my first Community Partner meeting at Roosevelt Community School here in Allentown. For those of you not familiar with the Community School model or how in works in this region, visit this page at the United Way of the Greater Lehigh Valley. Because of state budget cuts in education, elementary schools in the Allentown School District (a district and tax base not nearly as well-off as the Parkland School District that borders it) don’t have year-round gym, music, or art programs. Instead, they get nine weeks of each. Nine weeks of art. Nine weeks of music. Nine weeks of gym in a district where over 40 percent of elementary students are either overweight or obese. Keep that in mind. At Roosevelt, Allentown Symphony Hall is a civic partner providing free music education five days a week via the El Sistema program for the length of the school year. While I waited in the hall for my first meeting to start, I heard children talking to each other candidly and without prompting about how excited they were to be able to start El Sistema. At another ASD elementary school, fliers for after-school fitness clubs paper the walls. Mentoring programs, art programs, financial planning programs…these are all being organized and run by teachers, parents, volunteers, and, in the case of Roosevelt, a Community Director. At Roosevelt, supplemental education doesn’t stop with children. There are classes for parents, too, classes on parenting, financial basics, and English as a second language. This philosophy is at least two-fold as far as I can tell: parents with more resources and access help foster a better environment for success at home, and schools that are open to the community become places where parents, despite real or supposed cultural barriers, feel welcome. That’s essential. I’m sharing all of this for a few reasons that are related. It’s extremely important. As our city schools face continued challenges locally and nationally, and as budgets are cut because of the ongoing financial crisis or political maneuvering, I do believe these kinds of models will be an important way forward. As Director of Mission at First Presbyterian in Allentown, I work with volunteers at Roosevelt. 100 percent of Roosevelt students are on free or assisted lunch. Many don’t have enough socks, proper shoes, or warm winter clothes. If you want to help with that, regardless of where you live, get in touch with me. A few days ago, a post went up on the Valley610 blog telling people to add the Parkland Educational Foundation to your holiday gift-giving list. Jon Geeting jumped on this with a rather provocative headline. By and large, Parkland has money. By and large, gifts to the PEF will serve to maintain and further enhance the district’s profile as top in the region, and will help Parkland students maintain and enhance their already jack-pot experience. That’s fine. I owe a lot to the education I received in the 80s and 90s as a student in the Parkland School District. We had a lot of opportunity, and kids there now have even more. We had a ton of resources, and I can’t even imagine the kinds of resources that abound in each of the district’s schools at all levels in 2011. In high school, I was Debate Team president and the President of the Class of ’98, and I understand even more now how lucky I was to be where I was and to have had parents, friends, teachers, and administrators who all impacted my life in profound ways. Parkland has a great tradition, and I hope it continues. Kids in the ASD don’t have socks. They don’t have winter coats. They don’t have year-round gym or art or music. Many can’t afford school lunch. A few miles away sit schools bustling with opportunity in communities with money. If you have a few expendable dollars this Christmas, give it to Community Schools like Roosevelt in the Allentown School District. I like the intention, in some ways, behind the Parkland Educational Foundation’s idea of giving in honor of your favor teacher and so on. But seriously, why not donate to the ASD in your favorite Parkland teacher’s name? That’s what I’ll be doing.